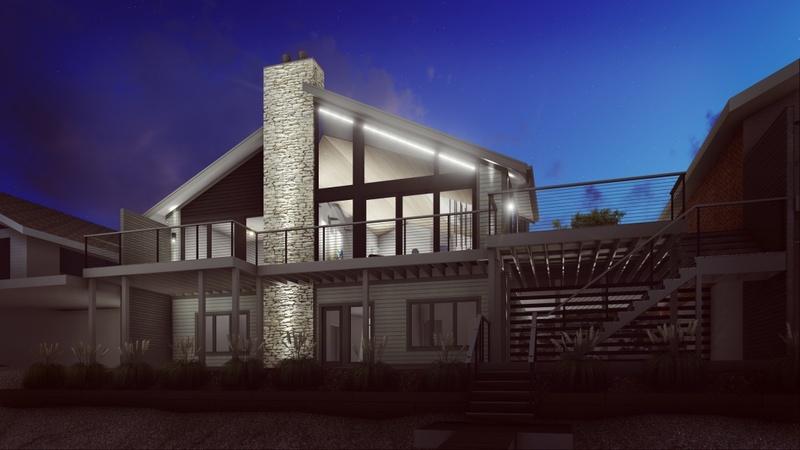 Modern Lakehouse revitalization at Lake Clearwater in Indianapolis is now complete! This neighborhood, originally established in 1980s, has been undergoing a wave of substantial property improvements for the last several years. Certainly, it benefits from lakefront property in an area with some of the best restaurants and shopping in Indiana. 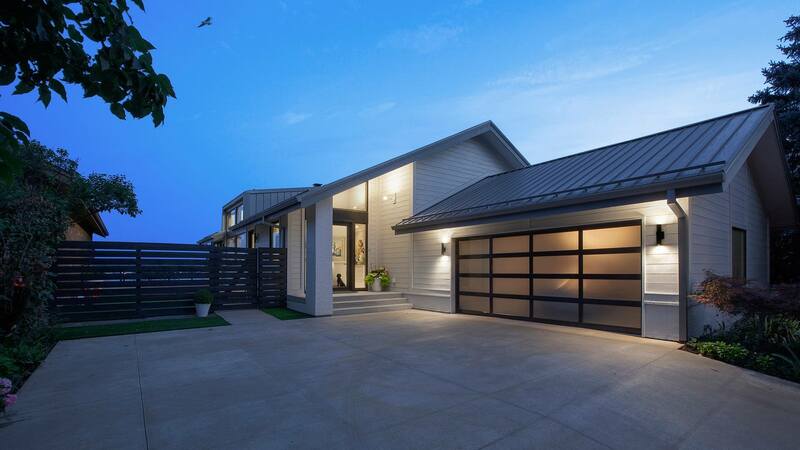 This project marks our third project in the neighborhood and second Clearwater design-build effort in 4 years. We really appreciate having another opportunity to work with this particular client, who is one of our all-time faves. Sometimes a team dynamic is spot-on, and it’s easy to get excited about going above-and-beyond for people that share our enthusiasm for a creative design process. Fittingly, our client started the process by affectionately naming the project, “Esther”. AIA selected Esther to be on the AIA Home Tour in September 2018, and we enjoyed seeing so many of our friends, colleagues, and clients on the tour! Here below are some media links featuring Esther. 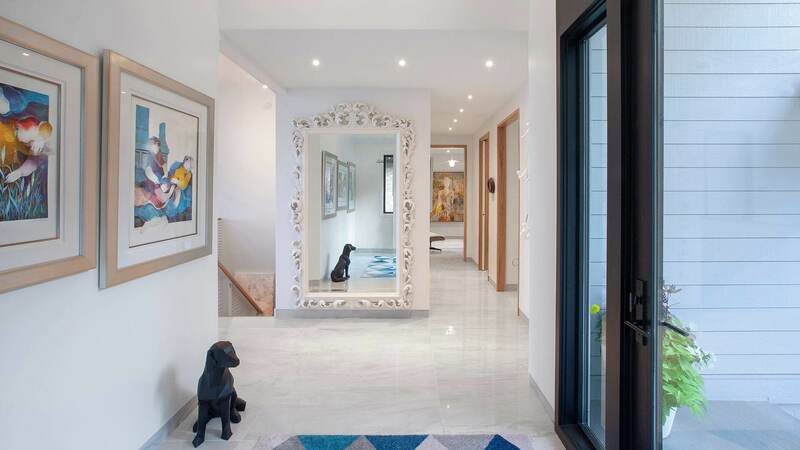 Previous owners had renovated the property several years ago, but it was time again for something fitting for “Esther”. So as one would expect, “Esther” wanted to include favorite features from Adagio that we helped design in 2010-2012. The question was how far would we be able to take the design with required approvals from the HOA. 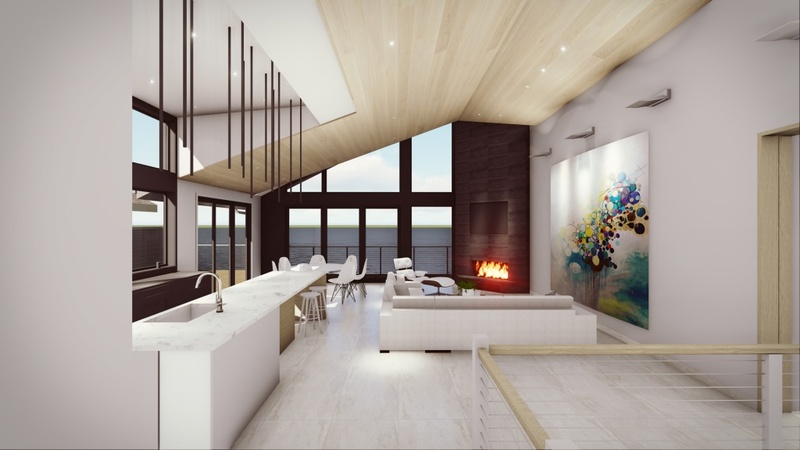 The design concept simplifies and highlights the existing structure with elementary expressions at entry, main living spaces, and lakeside maximizing south light and panoramic lakeside views. 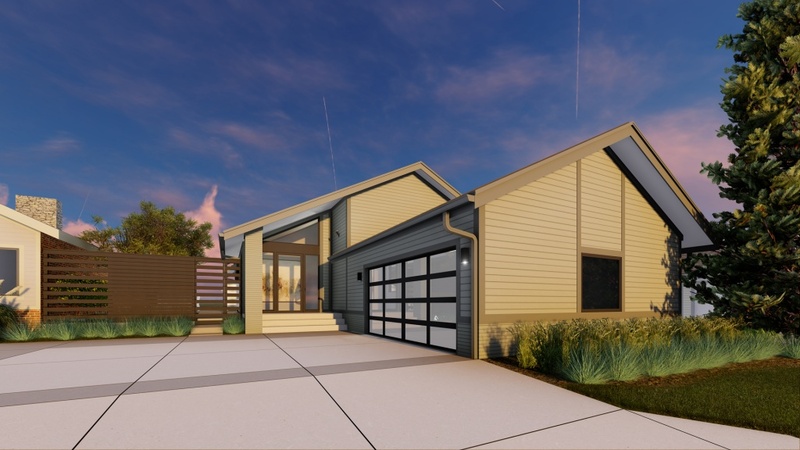 Also, we eliminated some of the original design complexities for a streamlined solution capitalizing on the simple open-concept gable form and structure. Entry, Kitchen, Home Office, Dining Area, and Master Suite are all completely remodeled. 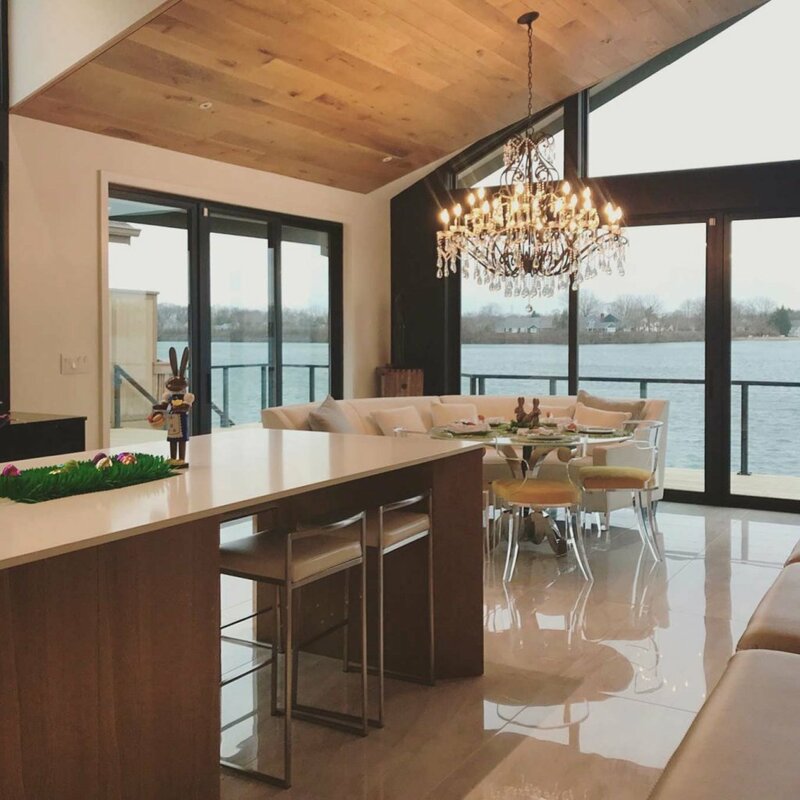 Highlights include a white oak ceiling, porcelain tile floor, custom cabinetry, refined trim carpentry, zinc standing seam roof, all new windows, and new exterior cladding. Our initial goal was to go darker on the exterior colors, but HOA-approved exterior color palette leans lighter. We may re-open the exterior color discussion again a bit later (see if we can go dark grey). Update: Architect originally felt that a darker exterior paint scheme was the way-to-go, but Owner encouraged a lighter color for a better neighborhood fit. It looks great with the lighter color (Judy, you were right again). 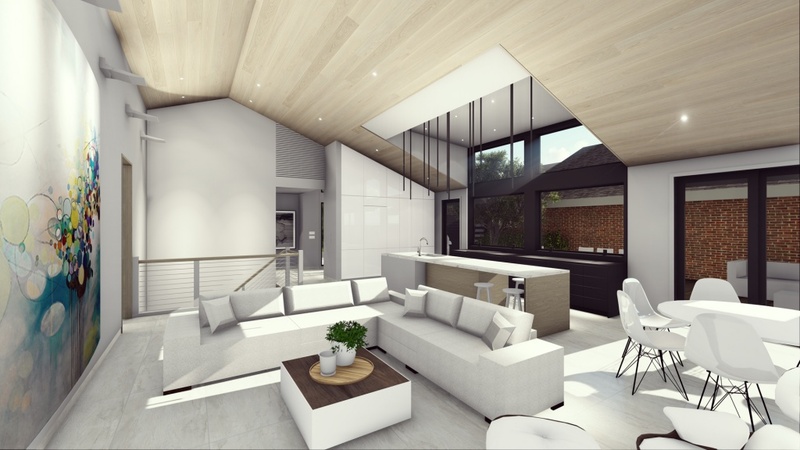 In the rendering below, you can see a hint of the large south-facing window wall popping-up above the roofline. 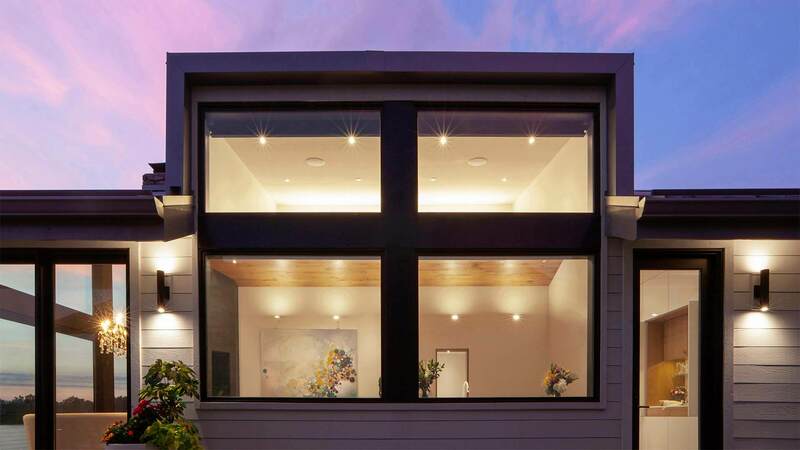 We simply wanted to grab some natural light into the main living space. This move became one of the main features inside and out. This project was a fun opportunity to fit-in but add a level of refinement to this 1980s development. The HOA is made-up of open-minded individuals who were okay stepping-out of the box a little-bit. 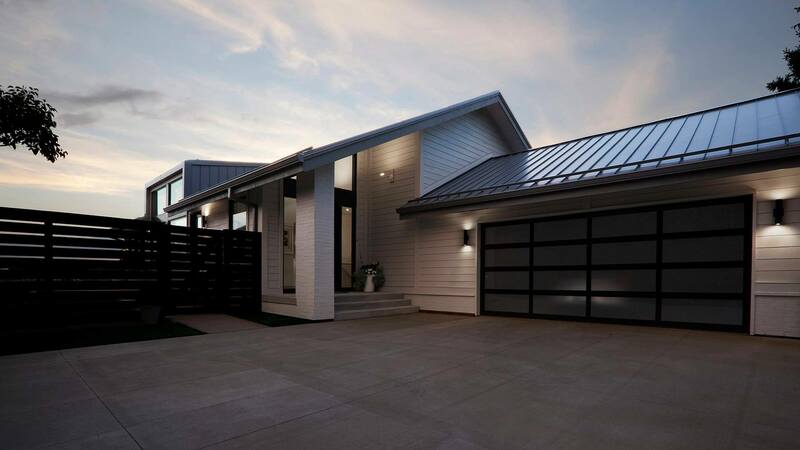 Some previous projects had integrated standing-seam roofs in accent-entry areas only. 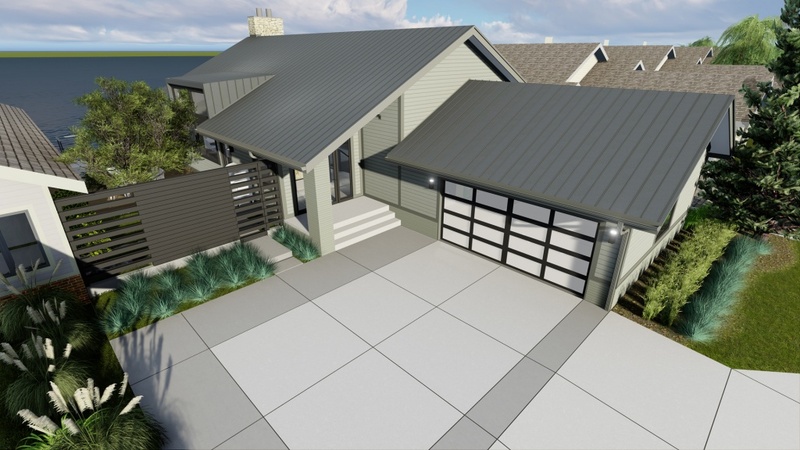 They entertained the idea of a zinc-clad standing-seam roof for this project pending samples and exterior paint finish review. 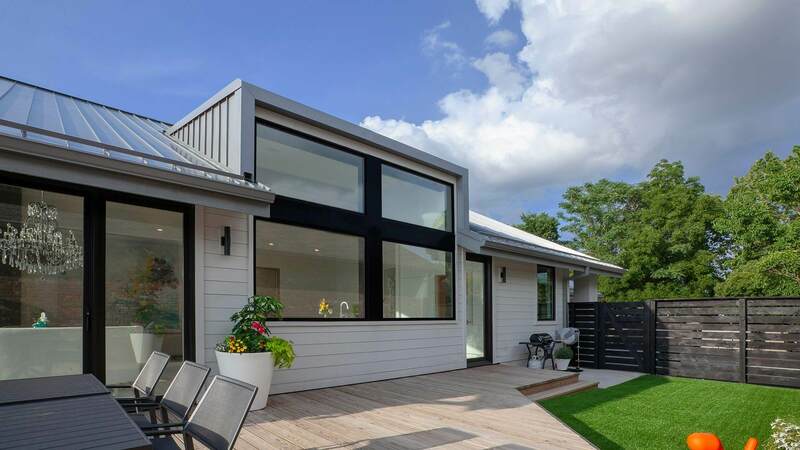 We proposed horizontal lap siding in keeping with the norm. However, instead of rough cedar lap, a smooth flush shiplap with reveal joints achieved the look. 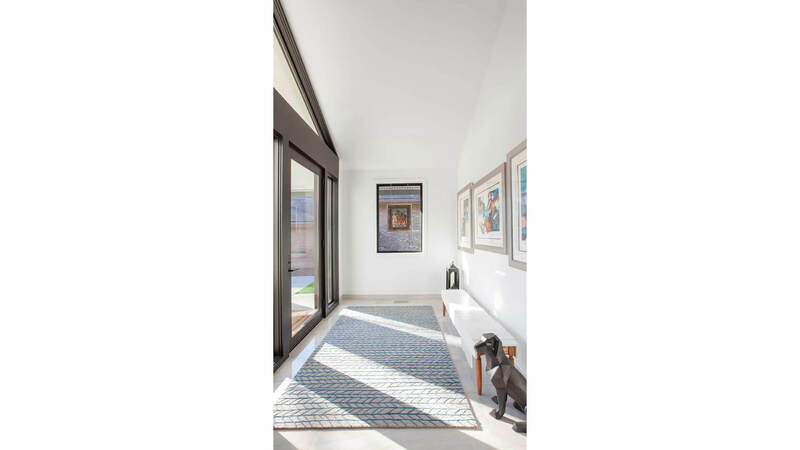 The entry concept below cleans-up the original inarticulate, busy, nondescript entry with the most simple extension of the existing roof structure. 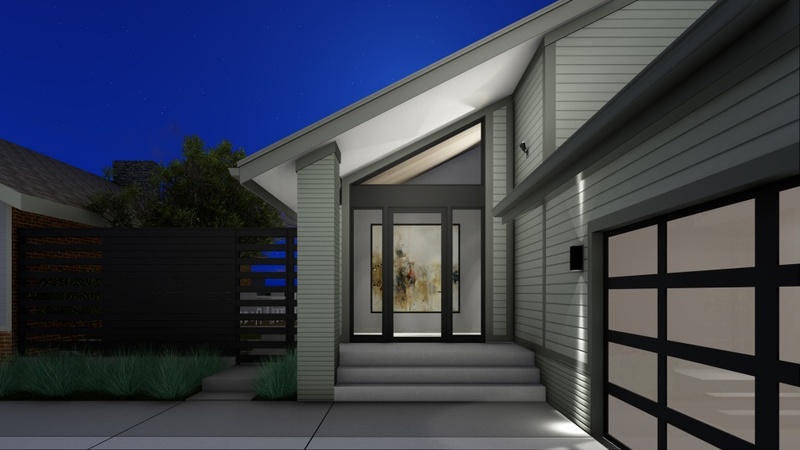 New front doors/windows face the street and include clear glazing to see directly-in, with foyer gallery wall providing visual privacy into the actual living spaces. The new garden privacy gate continues material and detail complimenting the new glass and aluminum overhead door. 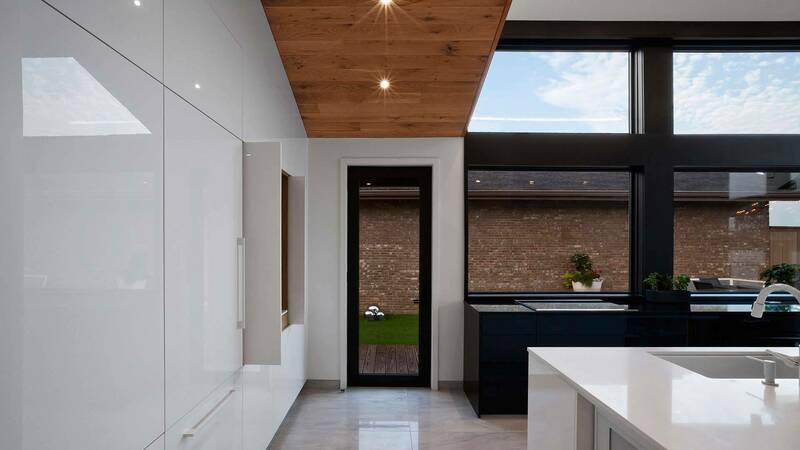 As with exterior, interior is a simple expression of pre-existing roof structure, and highlights views with completely new glazing. In the interests of budget and preserving the view, we were able to maintain but reclad the original fireplace. Also, we have an integrated lighting system highlighting the architectural features to achieve an overall controlled, layered ambiance. This image below is one of our favorite vantage-points in the space, as it highlights the south-facing window-wall anchoring kitchen. We finished-off the concept by finishing window, back counter/cabinet, and appliances in black. 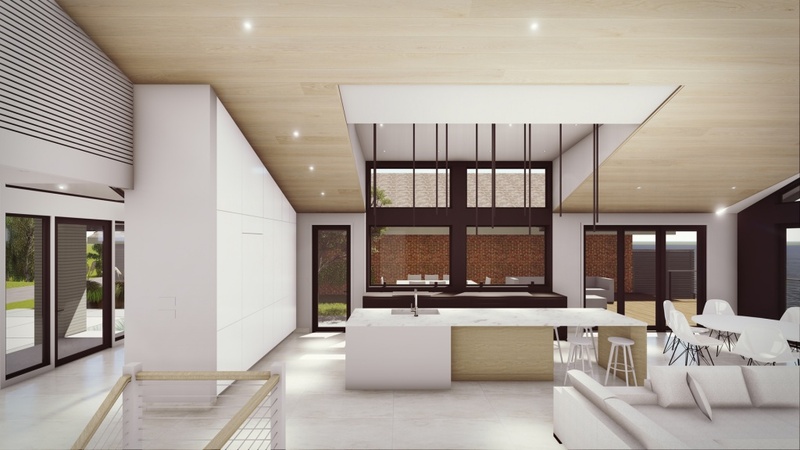 Then the 13-foot long island floats forward in a lighter tone, integrating with wood ceiling, adjacent white cabinets, and flooring. The slatwall to the upper left (photo below) is a creative way to hide the return-air grill for the HVAC. 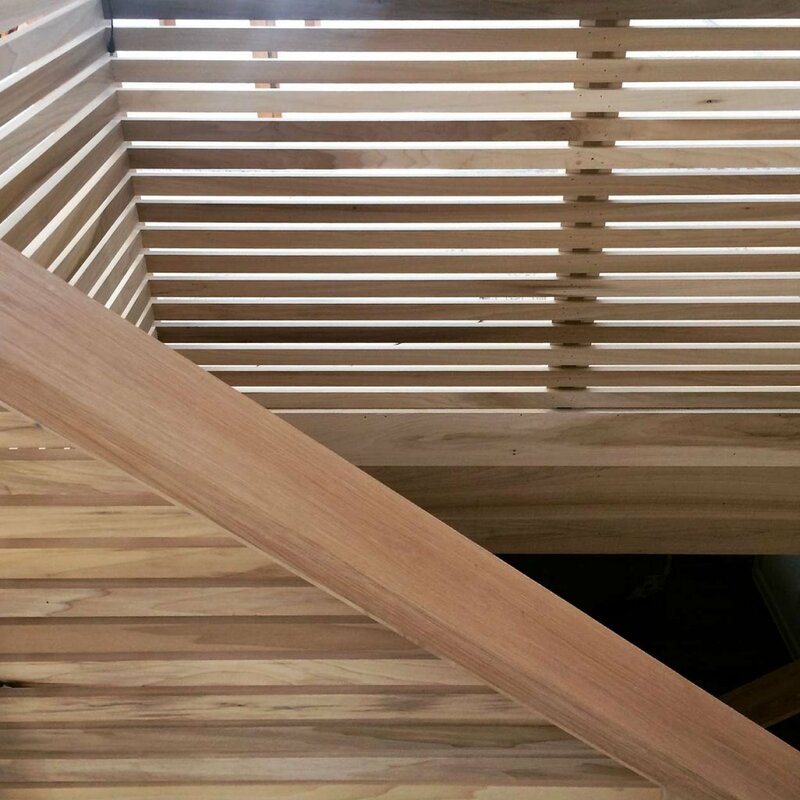 Later during the construction process, we refined the stair guardrails to follow the same slatwall detail for continuity and simplification. 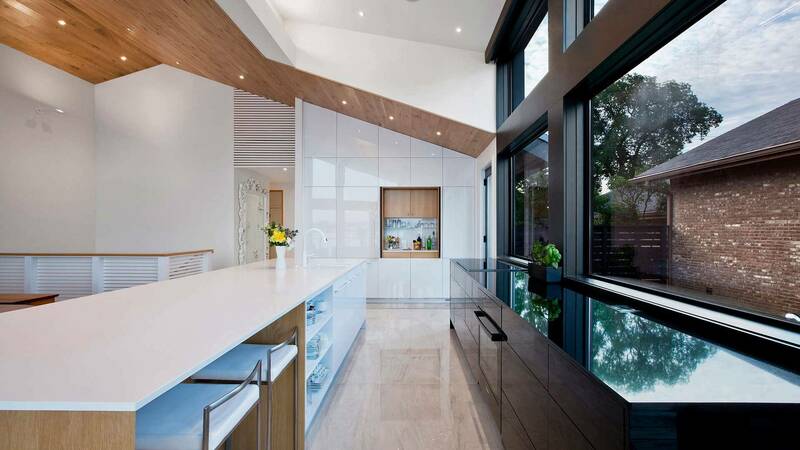 At this time, we were considering linear pin-lights hanging over the kitchen island. 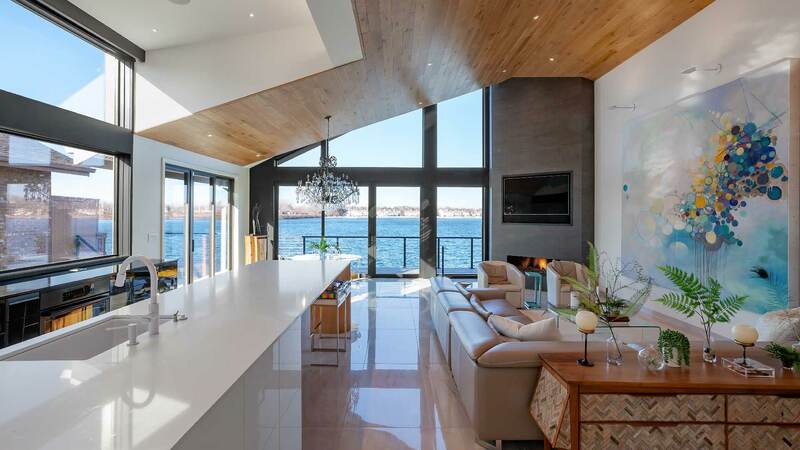 Instead, we shifted to simple 2″ can-lights over the island, and added a glass chandelier at dining table. It had to be either-or, because pendant lights in each location could have gotten cluttered visually. Good call by Judy once again. 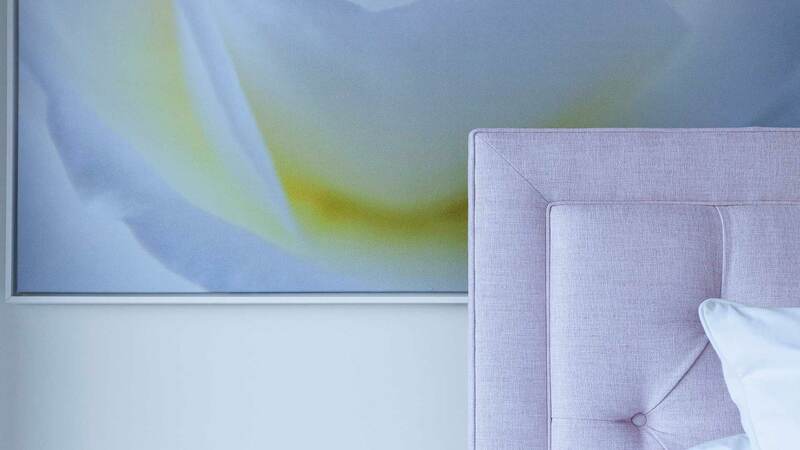 Our client has great taste, so we get to benefit from her overall orchestration of interior fixtures and furnishings. 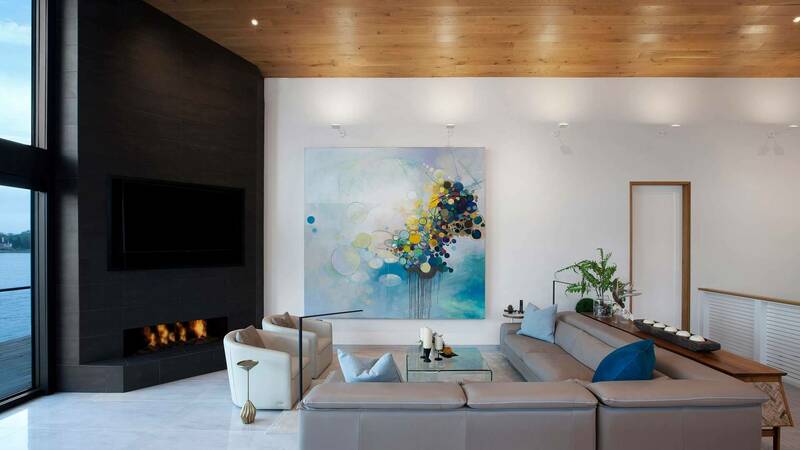 The large custom art-piece indicated on the wall to the far left was taken from previous residence (photo below). As you can see, we have thought-through most of the interior design elements before construction has begun. More decisions up-front usually reduce stress-level and improve overall chances at project success. From the lakeside, we looked at what impactful changes we could make within budget. The scope of this project focused primarily on the main level, with only minor cosmetic touches on the lower level. 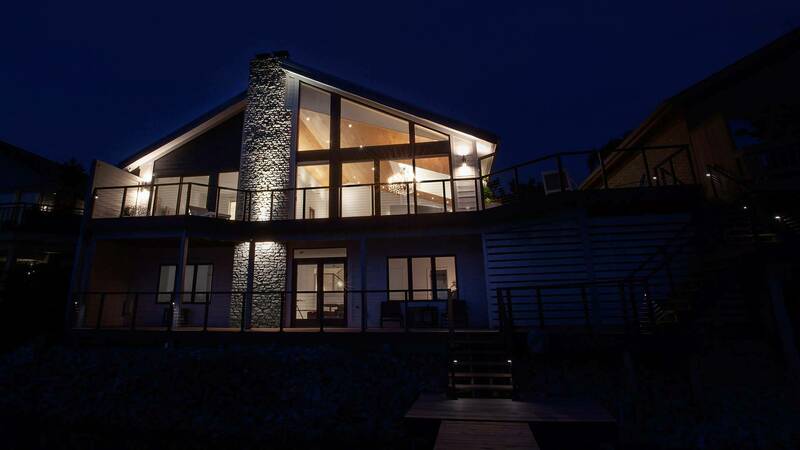 You can see below how the new glazing and lighted space presents from the lake. Bedroom to the left originally included glass transom and vaulted ceilings, but these enhancements were simplified during budgeting process. Design concepts can work at various budgets, and your Architect is the go-to resource to advise on value-engineering decisions. 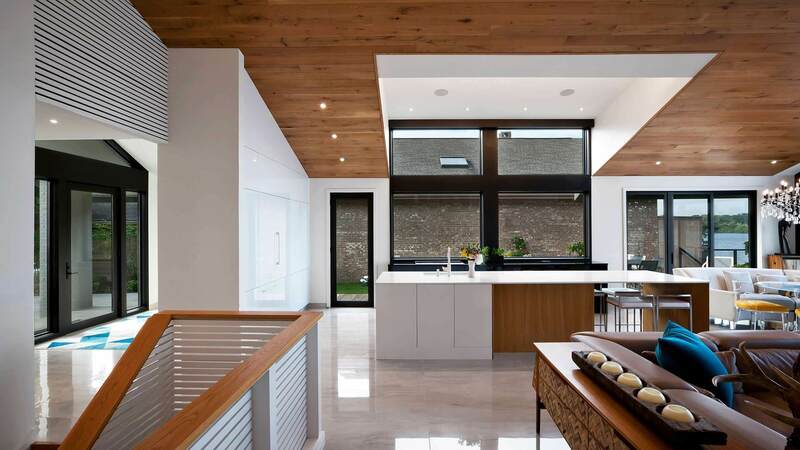 In the case of this project, the Architect was also the Construction Manager (via WERK | Building Modern), which streamlines the process even more. Please check-back, as we will add some before shots showing where we began with this property. We love breaking it open and getting to work. 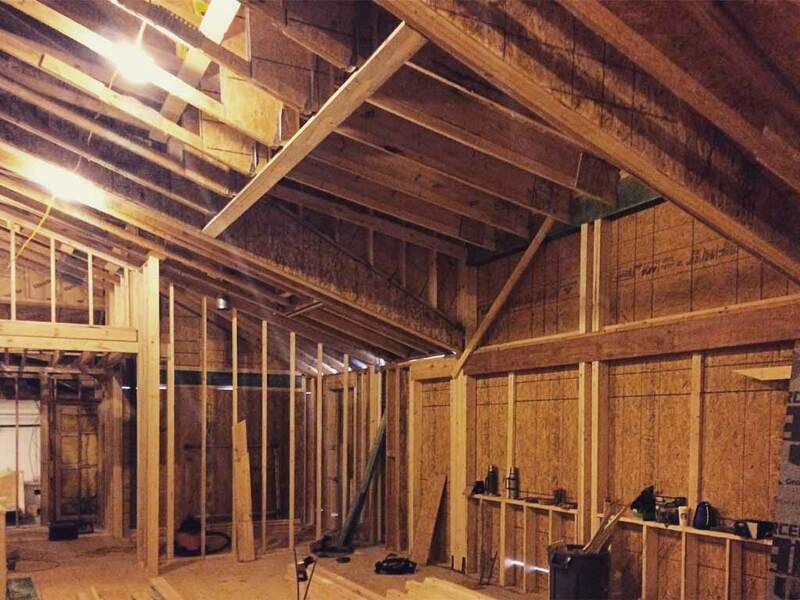 This photo below shows the framing stage after framers cleaned-out the space and blocked-in openings for winter until receiving windows. On the west-wall to the right, we added steel structure where needed to support the wind-loads and wall spans. 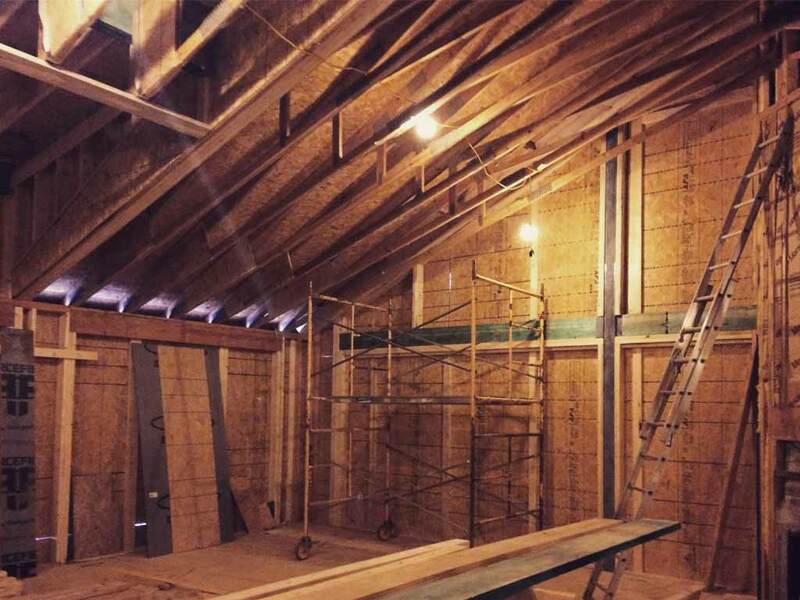 Furthermore, we modified existing trusses with structural engineer design-assistance. 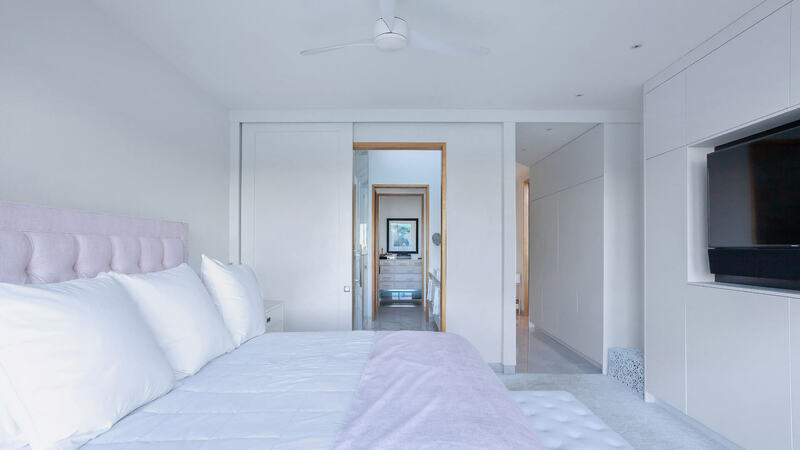 It’s really important to get a structural engineer involved when opening-up walls and ceilings. The reason is, some of these elements could be important for the stability of the structure. To the far left we can begin to see how the new south-facing dormer scales in the space. 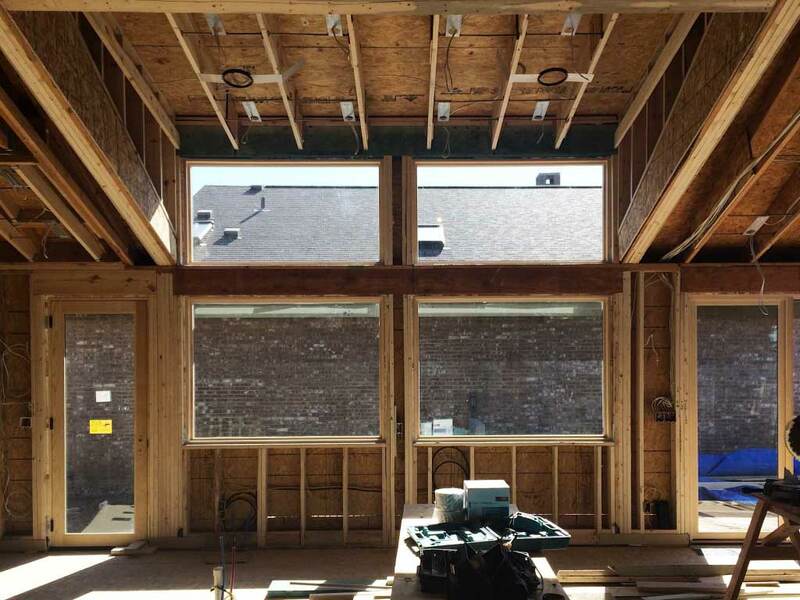 Here below is a good shot of the new window wall/dormer (looking SSE toward direction of main entry). 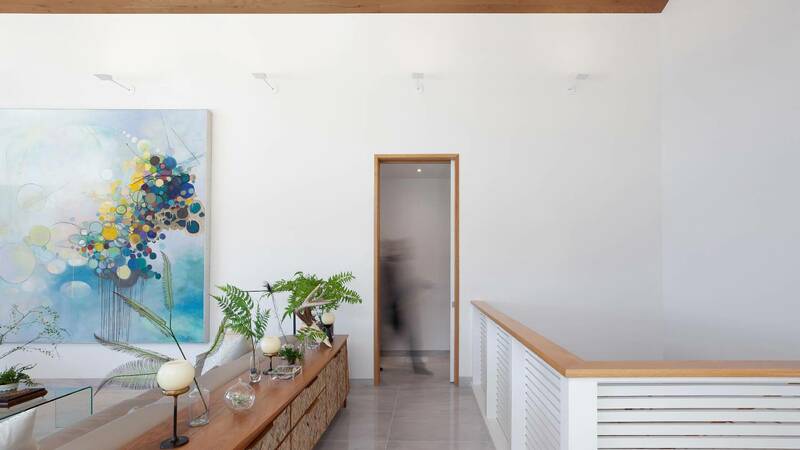 Entry is through the framed kitchen wall, with this wall providing privacy from new front entry to main living space. The construction of the project started in late fall-early winter 2016. 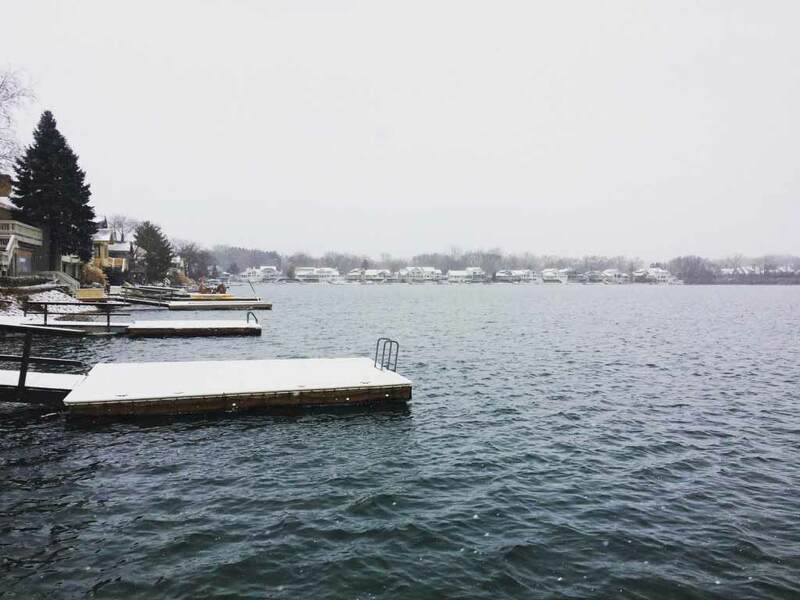 It looks like it was snowing this day (view from dock below). 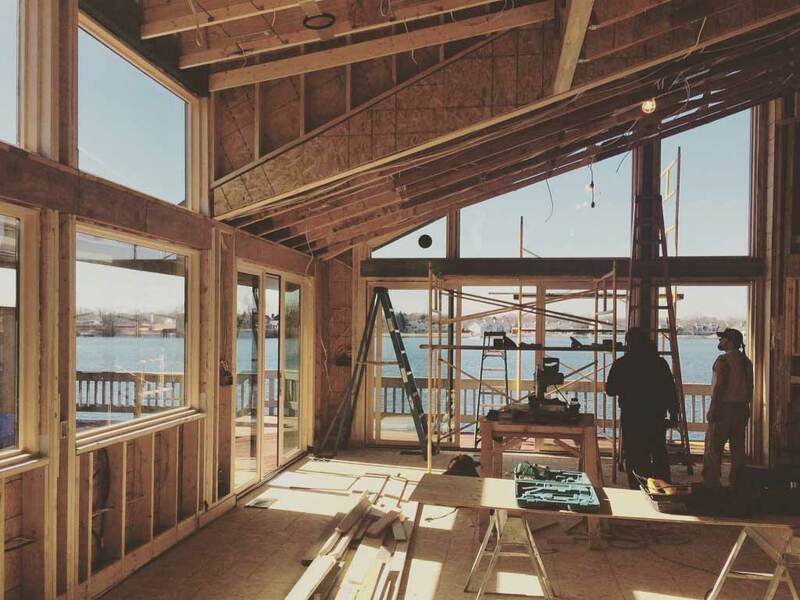 Windows arrived and we got to live the open views to lake and let sunlight help warm the space. From a scale standpoint, the interior feels as expected, but always end-up looking better in real life. We love this window wall and think it’s going to be money. 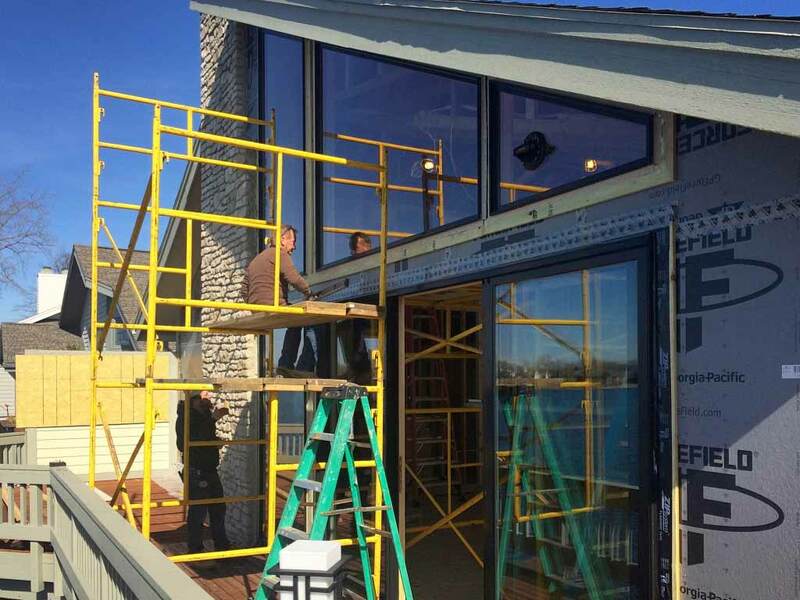 Here’s a lakeside view when window installations were underway. We worked with Franklin Window & Door on the acquisition and installation of Marvin Ultimate Series windows for this project. 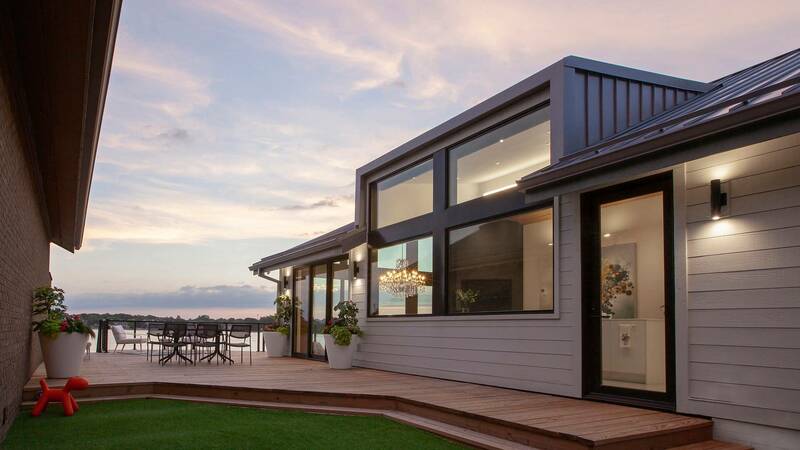 Having worked on a few properties, we know how lakeside winds and moisture can affect windows, doors, and siding. 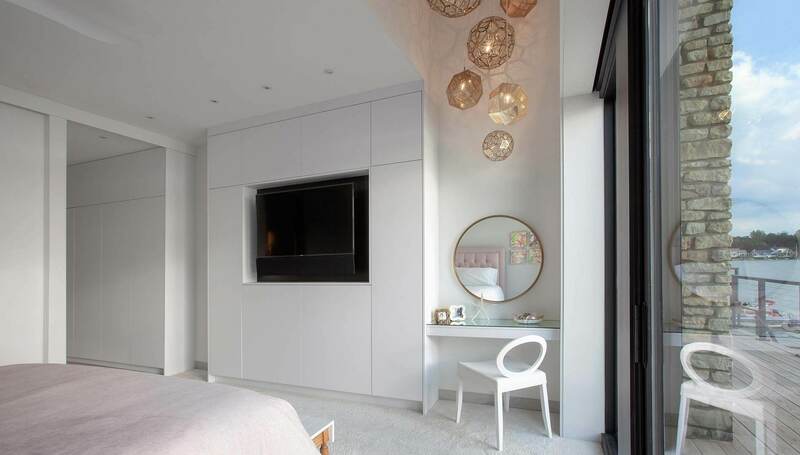 This is why we pay strict attention to the design and installation of these walls especially. 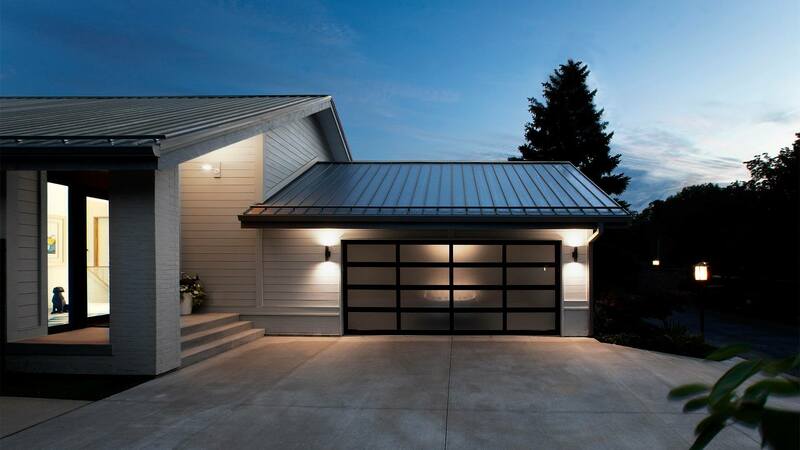 An excellent glazing product that manages water is important, as is the proper installation of flashings and sill pans. For this project, we also integrated a drainage plane (rainscreen) behind the siding that weeps water out of wall cavity. 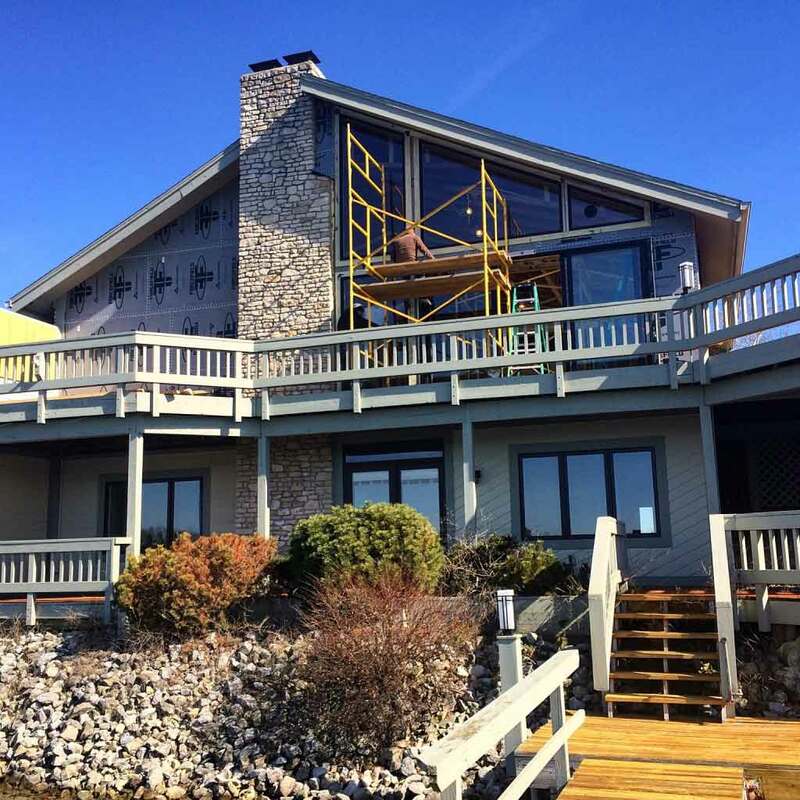 We designed and installed all new windows on lakeside while maintaining stone chimney, rooflines, and deck structure. Furthermore, we were able to achieve some minor enhancements to the decks, but had to maintain the existing 45-degree angles to maintain views from adjacent properties. Happily, we were able to install prefabricated cable-rail systems to replace the outdated wood guards. 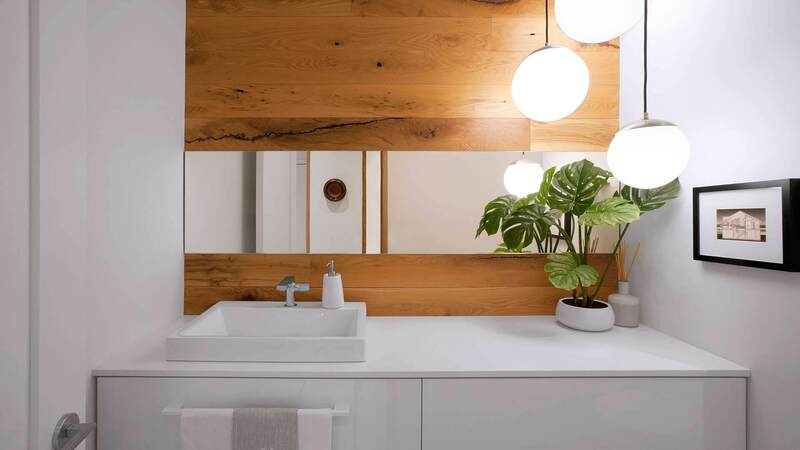 Derek Mills, (HAUS + WERK) worked as the project architect and also the construction manager for this project beginning-to-end. 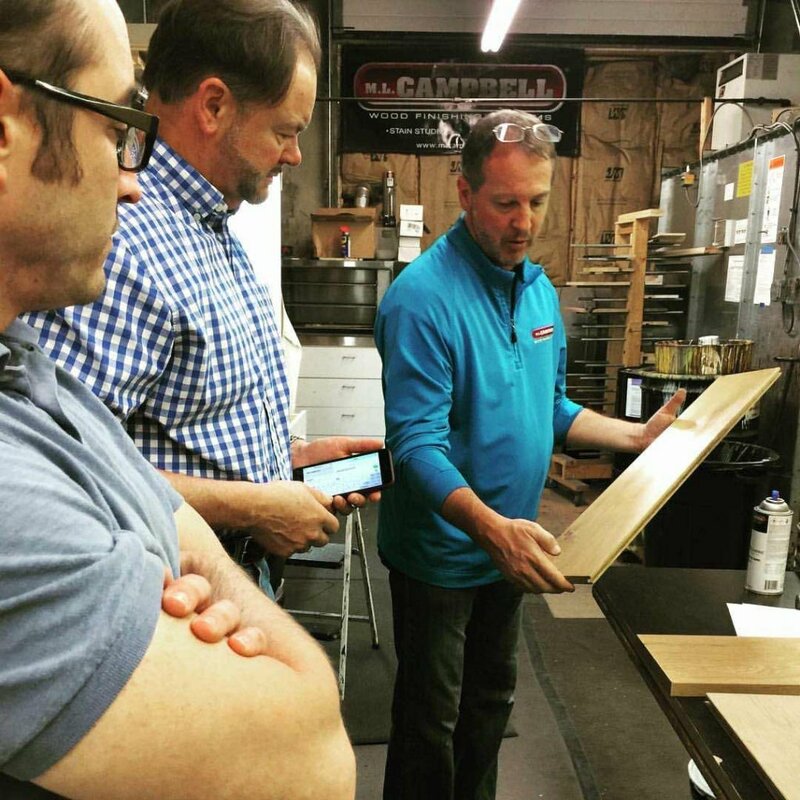 Here in the photo below, Derek is meeting with lumber supplier to discuss options for wood ceiling material. This lumber supplier also was helpful in brainstorming our options for the shiplap siding and then milling to our specifications. Yes, Derek Mills was overseeing the milling process. However, Derek was not doing any actual milling. 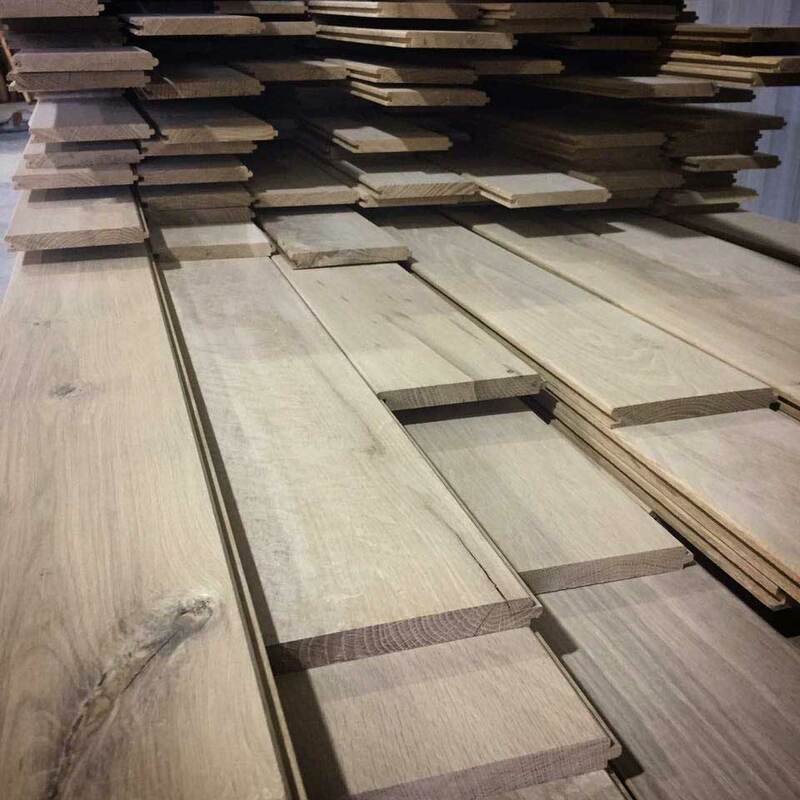 White oak is a great, timeless, beautiful material. Here below, the ceiling material is stacked on-site after milling and delivery. 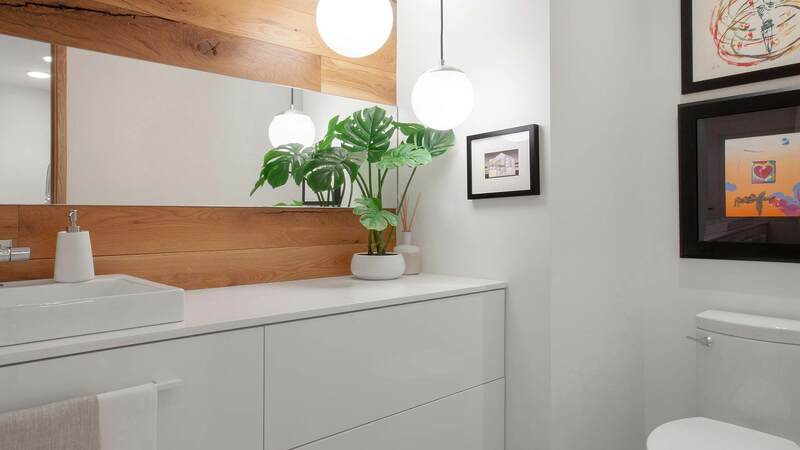 We were also able to utilize extra materials for the mirror accent wall in the Powder Room (see finish photos). We take pride in overall vision, but also details, because they cannot exist independently for best outcomes. 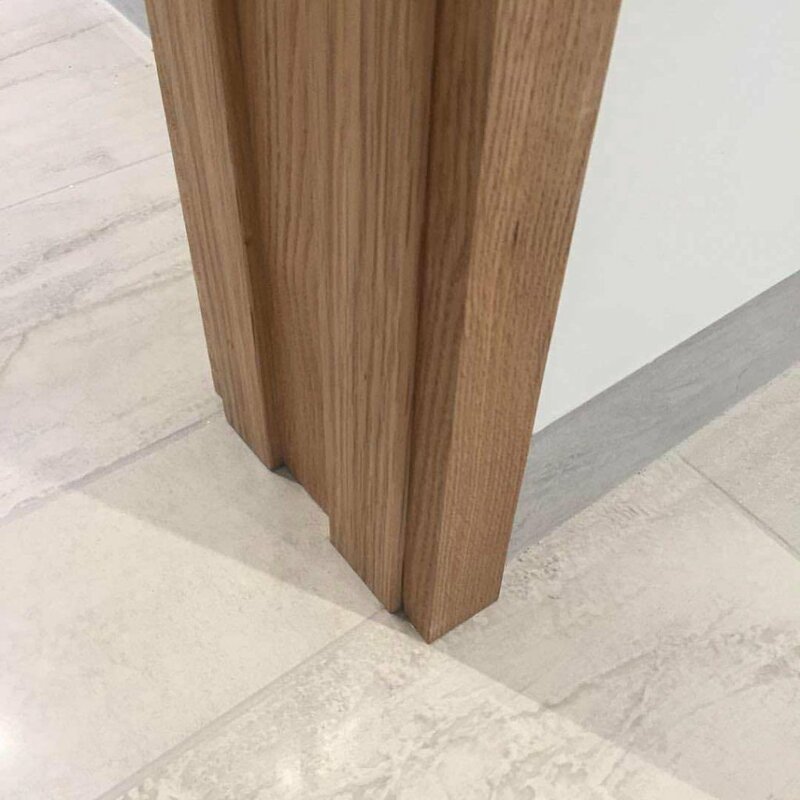 Architect as Construction Manager enables better communication, streamlining the successful detailing and implementation of details like the image below. 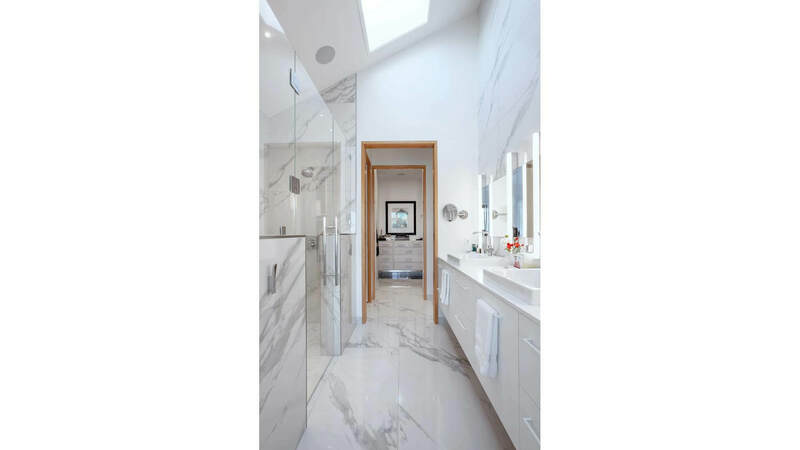 The proportions of materials, how materials intersect or abut … the design team needs to decide on every detail. Up-front, we define what is important to our client. 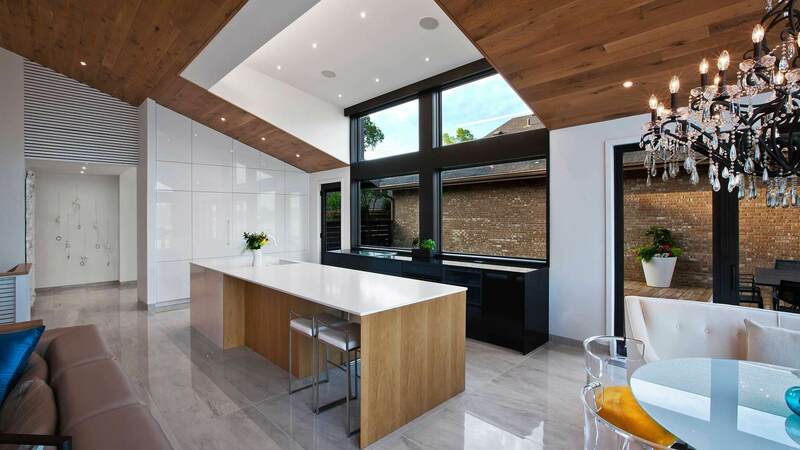 For this project, a level of design sophistication and construction follow-through was important. 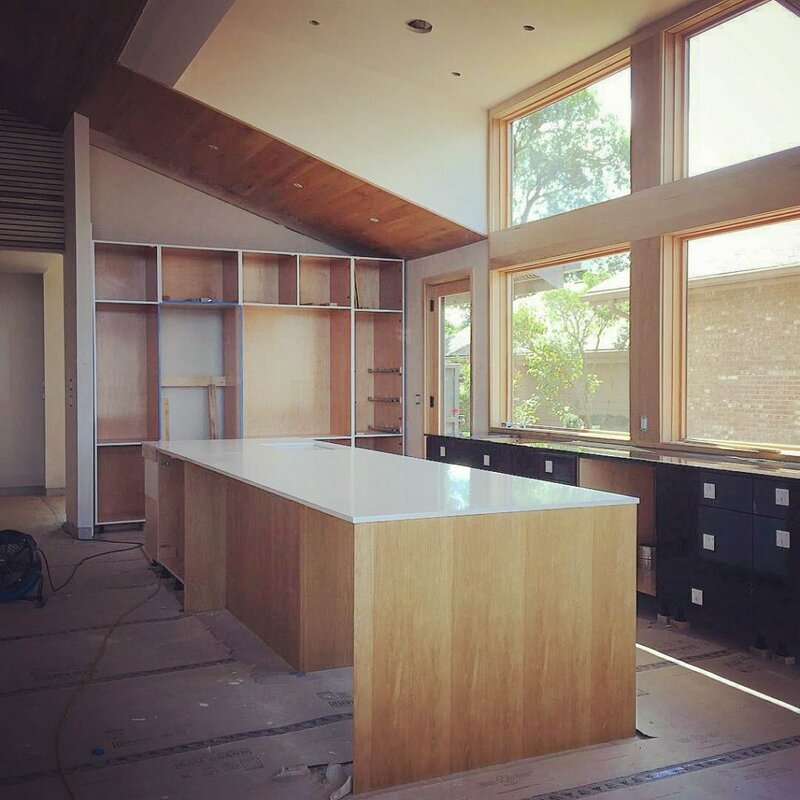 It was really exciting to see the white oak ceiling and the kitchen cabinetry going-in because we had tested so many design options. We really enjoy leading projects from idea to implementation, especially with clients who are fun to work with. Seeing ideas progress into built-form successfully is icing on the cake, really. Here below is the Poplar slatwall guardrailing system that we changed to compliment the hidden HVAC return-air grill detail. The trim carpentry work on this project is impeccable, as we have worked with this trade contractor for years on high-level projects. We can’t mention their name, because we need their availability on our projects, :). Our client sent us this image on Easter Day, 2018. Please check back on this project, as we’ll be adding more about the design process. 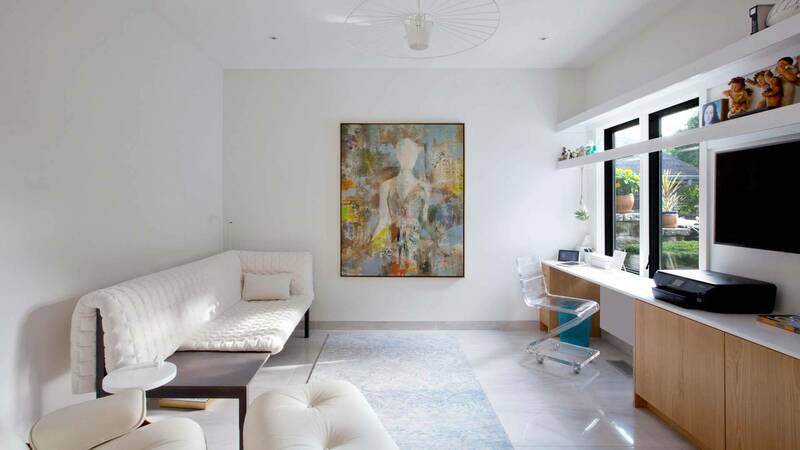 In addition, we are planning to supplement the finish photography with sunny interiors when the time is right.